Wear this easygoing, versatile top in different combinations with or without the optional neck piece and a belt for a variety of great looks. 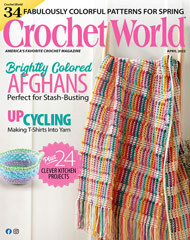 This e-pattern was originally published in the Autumn 2012 issue of Crochet! magazine. Size: Includes Woman's S through 4XL. Made with medium (worsted) weight yarn and size F/5/3.75mm hook.